Good Sun. Afternoon! I wanted to share with you a card I made upon request from the sweet lady that does my nails. Her family is going thru a difficult time with a family member battling cancer. She wanted me to make a card to give to her brother ( it is her sis in law). Card makers would agree that making something serious like a sympathy card is hard, but from time to time, we do have to make them. 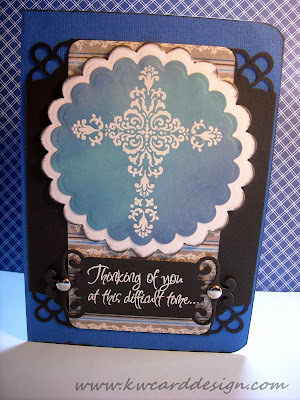 I bought a cross stamp set from Michael's a few months back, and this is the first time using it. I did the emboss resist technique, and used my distress inks. I used 3 blue colors, chipped sapphire, broken china, and faded jeans. I die cut my focal image with two scallop dies from my nesties, and for my sentiment, I used one of the tags from fanciful tags. The patterned paper comes from Authenique called Journey. I used one of my MS punches to punch the corners to give them a little extra "something". My card base is from AC's from the cards and envelopes pack.